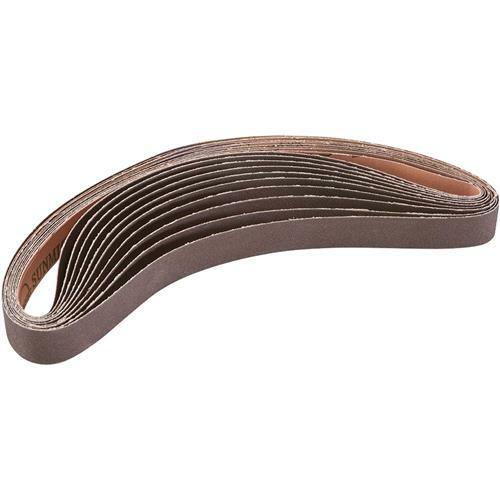 1" x 30" A/O Sanding Belt 100 Grit, 10 pk. Grizzly H4859 - 1" x 30" A/O Sanding Belt 100 Grit, 10 pk. Extra 100 grit, 1" x 30" sanding belts for Grizzly Model H3140. Pack of 10. Exactly what I ordered and needed. Worked perfect. I bought 2 packages of 10 belts several years ago. Now, due to age they keep breaking at the splice when I try to use them. I wasn't sure if the cause of breaking was a mechanical problem or the belt itself. The new sanding belts work fine so it is the age of the belts that cause them to break. It would be proper for Grizzly to reimburse me for the cost of replacing faulty sanding belts. Exactly what I needed. Hard to find around here. Fast service too.